Enjoy a wonderful, low cost, Puerto Rico, vacation rental at our "House in the Hills" (Casa de Loma) on the beautiful East Coast of Puerto Rico. Located near Humacao, our three bedroom vacation rental accommodates parties of up to 8 adults in comfortable beds (no futons or sofa beds) with two port-a-cribs for two tots. The large private swimming pool is set in a garden courtyard, offering privacy in a beautiful setting. Spend all day by the pool or travel the island to see its many sites and lovely beaches. The choice is yours. NEW SWIMMING POOL: We have recently installed a large, private swimming pool enclosed in a very private, garden courtyard. 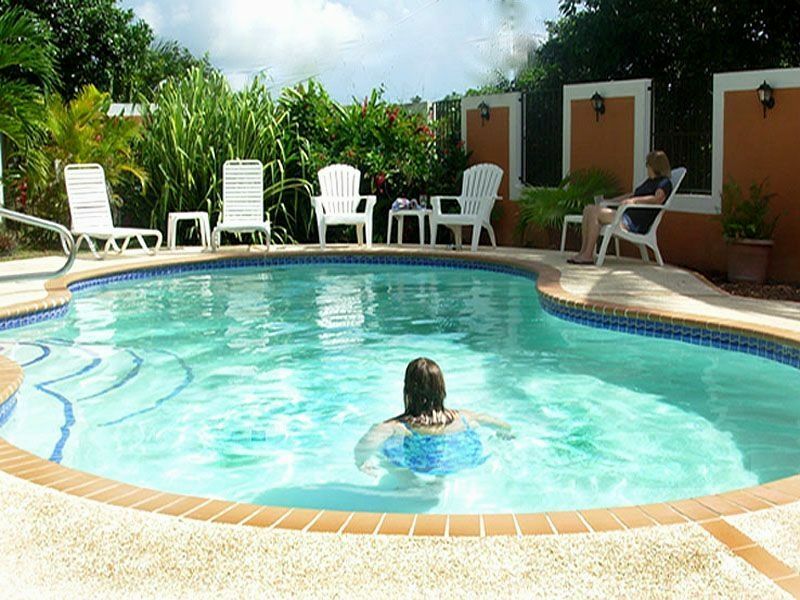 The pool is large enough for six adults or an entire family to enjoy at one time. It has lighting for night-time swims and is a wonderful addition to this cheerful home. Our vacation rental is convenient to beautiful Puerto Rico beaches - such as Luquillo and Seven Seas; World class Puerto Rico golf courses like Palmas Del Mar; the mountainous El Yunque Rainforest - the only rain forest in US National Forest System; Day trips to beautiful and remote Puerto Rico islands - such as Culebra and Vieques; Resorts and Casinos; Amazing snorkeling and scuba diving; as well as the vibrant and historic city of San Juan. "Casa de Loma," our low cost Puerto Rico vacation rental, will make your dream Puerto Rico vacation affordable! The interior of Casa de Loma was recently redecorated to reflect the architecture of historic Puerto Rico. (For a full "House Tour" see our Home Page link below.) Throughout our three bedroom home, a motif of archways was used in combination with Caribbean colors to create an inviting and relaxing feel in every room. A large, gracious porch provides a shady retreat all day and allows dining with a view. Two large tiled bathrooms are equipped with modern fixtures and showers. In the comfortable well-ventilated bedrooms, all beds are new and each room has its own ceiling fan. The house has ample parking, an emergency water supply, and a large yard with citrus, palm and flowering trees. If in season, feel free to pick your morning grapefruit. The master bedroom features a queen-size bed, a large six drawer dresser, a plush side chair, and large tiled bathroom with a shower. A day and trundle bed allows 4 to sleep comfortably in the master bedroom. A second bathroom serves the two additional bedrooms. One of these bedrooms has two twin beds and walls decorated in "Hibiscus" pink. The other bedroom is painted in a bright, "Caribbean Sea" blue and features a double bed and windows on two walls. A full-size dining area includes a table for six with comfortable chairs so that you can relax over a leisurely meal. The front porch overlooks the hills of Las Piedras, providing a quiet place to read and relax. Views of the yard include many flowering shrubs, banana trees that you are welcome to pick from, and an array of palms. The porch has an area that is large enough for dining. We often dine on the porch to view the pleasant pastoral setting and to enjoy the evening breezes. Casa de Loma, is in Las Piedras, Puerto Rico. Las Piedras is a suburban community high in the hills just west of Humacao. The house is a 45 minute drive from Puerto Rico's Luis Munoz Marin International Airport in San Juan. It is situated more than 1000 feet above sea level, overlooking striking vistas, including rugged mountain ridges, pasture lands and neighborhoods of Caribbean/Spanish architecture. The vacation rental surroundings are lush, verdant and tropical. Palms, citrus trees and yucca plants abide. Flowering bougainvillea, poinsettia, flamboyant and hibiscus color the hillsides. On a clear morning, as you descend the hill to town, your views will include spectacular vistas of the El Yunque Rainforest summits. Jim Meighan has been renting vacation homes in Puerto Rico since 2000. He believes that Puerto Rico is a wonderful island to tour, offering many unique experiences not found in the US, Canada, or Europe. He divides his time between New Hampshire and Puerto Rico. He invites you to enjoy the island, it friendly people and its rich history and culture. Since beginning his vacation rental business, he has had more than 1000 guest parties stay at one of his four homes. The east coast of Puerto Rico is the best location for visitors who like diverse activities. Within a 45 minute drive of their homes are numerous lovely beaches, the El Yunque rain forest park, 5 resorts (offering golf, tennis, restaurants, casinos, horseback riding, scuba, deep sea fishing, etc. ), historic Old San Juan, modern San Juan, ferry's to off-shore islands Culebra and Vieques, bioluminescent bays, shopping, adventure tourism, and other activities. When you stay at Casa de Loma you experience Puerto Rico! You live in a cozy home with many amenities and comforts. You have a private swimming pool in a garden courtyard. You have lovely porches with pleasant views. You see people going about their daily lives and you get a real sense of how it would be to live on this wonderful island. toilet, shower, Lovely tiled bath with window and large shower. toilet, shower, Bath ensuite with master bedroom, tile with large shower. Pleasant tile bathrooms with showers. An easy 12 minute drive puts you on Palmas Del Mar's lovely beach. Many other beaches along Puerto Rico's East Coast, easy uncrowded drives with beautiful views. Pleasant views of the rural, mountainous countryside from lovely porches. A tropical paradise! Use your computer in any room of the house with the Wifi Network. Side by side with Icemaker with chilled water and large freezer. Complete kitchen: microwave, ice maker fridge, electric range, toaster oven; blender, utensils and cookware; china, glasses silverware for 10. Dine inside at dining room table, or outside. Wonderful porch with large table. Great setting for all meals. Many channels: Features major US Networks in English and sports networks. Small library of novels and other books and magazines. Kayak at nearby Humacao nature center or bio-bay kayaking in Fajardo. Admission fees required. Great Porchs with lovely views for dining and relaxing. Pool Side Patio in Walled Garden. Discounts at Palmas Del Mar Tennis Club provided at no cost. Discounts at Palmas Del Mar's two 18 hole courses; 5 other golf courses nearby. Large, very private pool in walled garden. Just wonderful! Check our primary web site for lots of photos. Had a wonderful time. The house was very clean and well-equipped. Had time to visit some clubs and restos in San Juan. Will definitely come back. Case De Loma was the perfect spot for our trip! We agree! Casa de Loma is well located for may day trips, including: many different beaches, visiting Palmas del Mar Resort, Culebra and Vieques Island trips, El Yunque Rainforest, Old San Juan and San Juan Condado area. Glad you had fun! We had an absolute wonderful time at Casa De Loma. We spent 8 nights at this lovely house in the hills being serenaded by the coqui. The owner, Jim, is truly a pro at this and the information packet he sent to us covered all the necessary details for finding the house, staying in the house, and enjoying our time in Puerto Rico. The pool and the kitchen were perfect after a day of exploring around the island. We could eat out for lunch then relax at the house, swim, and make a little something for dinner. The house was clean, welcoming, and comfortable in every way. We can't wait for another opportunity to explore Puerto Rico and stay at Casa de Loma again! We are always glad to hear that guests had a good time in PR when they stay at our home! The best compliment of all is that you plan to return. We look forward to it! We had such a wonderful time at Casa De Loma! The home is in the hills in Las Piedras and it takes a minute to know where you are, our GPS said "unknown road" So luckily we had the handy map that Jim (the owner) sent us! The home was equipped with all we needed. Lots of towels, beach chairs, sheets, a washer and dryer. All the rooms had overhead fans. There were many areas to relax in and plenty of room for all 6 of us. The sounds of Coqui at night, and Roosters in the morning made us feel as if we lived there round year. I have family on the north coast, and didn't want to crowd them by staying at their homes. This worked out perfectly. We traveled to west to Ponce, North to San Juan, centrally to Guavate for some good eats and to Fajardo for tours. We will stay again, and have already recommended our friends! Thanks Jim for a GREAT time! With thanks from The Jacksons! Thanks for posting your review. We believe when you stay at Casa De Loma you experience the real Puerto Rico. You find out what it would be like to live here and at the same time enjoy a relaxing vacation in a lovely spot. Sounds like you did just that! Thanks again. A Real Vacation for Us. Casa de Loma was perfect home and the perfect location for our trip to Puerto Rico. My grandmother grew up on a farm in Puerto Rico and we wanted to experience the kind of rural setting she had lived in as a girl. The hills of Las Piedras are just that. There are fields of plantain trees, cocoanut palms everywhere, mangos growing wild in this country setting. The house itself was cool and breezy and the swimming pool in the large garden was a joy. The neighborhood was well-kept and the neighbors were embracing and helpful. We loved the views from the narrow road leading to the expressway. It took us only 4 minutes to drive to the expressway, but staying high in the hills we never knew it was there. We visited the rainforest (walked in and swam in a waterfalls!) spent an evening in Old San Juan, took a ferry to Vieques Island (about a 25 minute drive away) and went to the Palmas Del Mar Beach to jump in the waves. The highlight of our trip was going over the mountain to Maunabo and Los Bohios Beaches. Beautiful natural beaches on each side of an historic lighthouse. Almost alone on these beaches, we felt we were in a tropical paradise. The house was as advertised. Comfortable, well-equipped and Cable TV and Wifi. We had everything we needed including access to a washer and a dryer. Thanks for share it with us; we hope to come back soon! A safe, relaxed island house in a well-located town in the countryside. The owners were great. They thought of/took care of everything. The house was cozy and secure. This was a return visit with my family, and everything at the house had just gotten better - especially the georgeous, totally private pool! We loved this place because you could just jump on Route 30, and pretty much get to anywhere on the island with minimal hassle. It was also fun staying around Las Piedras and exploring the countryside in the Southeast. Your right Judy, Las Piedras is an easy place to tour from. 5 or six beaches within 30 minute drives. Easy access to the El Yunque Rain Forest Park, 45 minutes to Old San Juan and 35 minutes to the Culebra/Vieques Ferries. All this convenience and a private tropical paradise too! Thanks. We provide passes for weekday access to the private Palmas Del Mar Beach Club that also provide discount for Tennis and Golf at the Resort, which is 12 minutes away. The home is near many lovely beaches, ferries to off-shore islands, El Yunque Rain Forest Park. It is a 45 minute drive to Old San Juan We provide a 30-Day Trip PDF file that we have written to guide you to the best beaches, and other attractions from historical home tours to the Camuy Caves! You Casa De Loma is a wonderful home in a great location. Standard Rates: 5 nights= rental cost of $800;6 nights=rental cost of $850. To receive the rate quoted automatically, you must book 7 nights or longer. Shorter stays are priced at a hight daily rate.